الزمرد يتكون اساسا من سيليكات البريليوم والألومنيوم, يوجد في مناجم بين الصخور الصلدة والرخام بخلاف معظم الأحجار الكريمة, لونه أخضر غامق عميق وشفاف, ويحتل المرتبة الثالة من حيث الأهمية. يكتسب لونه الأخضر لوجود كميات ضئيلة من الكروم أو الحديد, وبالمقارنة بالأوزان يعتبر الأعلى قيمة بين الأحجار الكريمة, خاصة عندما يتخلله عروق من أملاح معدنية أخرى, إن أحجار الزُّمُرُّد الكاملة لنادرة جدا، وإذا وُجدت تكون أغلى من الماس. والزُّمُرُّد الأزرق أغلى من الزُّمُرَّد ذي اللون الأصفر. If there is unique emerald ring in your future, you definitely should read this. Emerald rings are gorgeous, no doubt about that. Many of us love them because of that rich, green color - it reminds us subconsciously of warm summer days, green grass, and leaves swaying in the breeze. 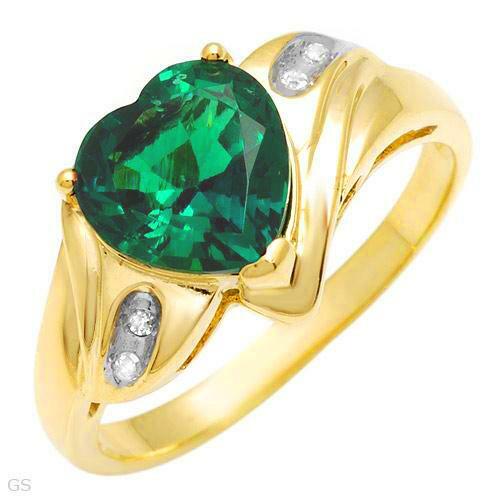 That is a wonderful reason to love something, but there are things you need to know about emerald rings and emerald engagement rings, also. 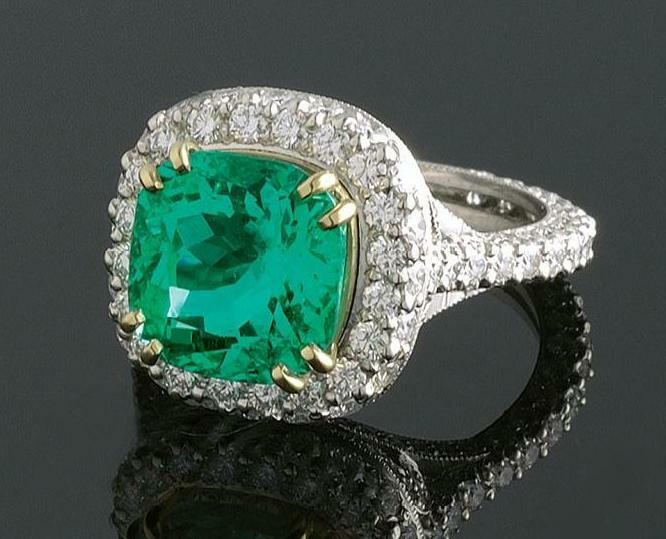 Beryl is the colorless mineral that makes up most of the composition of emeralds. It takes a small amount of chromium or vanadium to give an emerald its beautiful green color. You will notice that most emeralds are treated with oil that helps to seal it and increase its clarity and the intensity of its color. This is an acceptable and necessary practice, since the oil fills tiny natural cracks in an emerald and helps keep it from cracking. Do not ever soak an emerald ring, or place it in an ultrasonic cleaning machine. Soaking it will remove the oil, making the stone look dull or matte, and it will be easier to crack the stone. Just the vibrations alone in one of those machines may crack the stone anyway, so steer clear of those, even if you have an emerald and diamond engagement ring. The diamonds in that sort of ring will have to be cleaned some other way, like with a jewelry polishing cloth. Emeralds are so rare that if you have a high quality, flawless emerald, it will be more valuable than a high quality, flawless diamond. Emeralds are considered flawless if they contain only inclusions that require a magnifying device to see. That is because all emeralds contain inclusions. 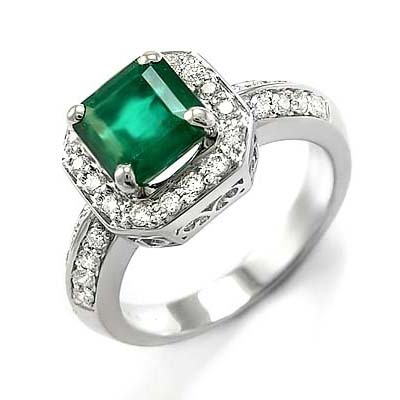 A top quality emerald is one that is flawless and has a lovely, dark green color to it. Since all emeralds contain flaws and small cracks, even stones treated with oil can crack or break if they are treated roughly. Always remove emerald engagement rings, and all emerald rings when you do housework, play sports, garden, or anything where the ring could take a hard hit. اتفق باسم مرسى مهاجم الزمالك المعار لنادى لاريسا اليونانى مع مسئولى الأخير على فسخ عقد إعارته بالتراضى . وشهدت الفترة الماضية تعثر عودة باسم مرسى لليونان مرة أخرى للانضمام لصفوف لاريسا بسبب عدم تمكنه من إنهاء إجراءات السفر لظروف خارجه عن إرادته . وتواصل باسم مرسى خلال الساعات الماضية مع مسئولى نادى لاريسا وعرض عليهم الموقف كاملا وصعوبة استكمال فترة إعارته وتم الاتفاق على فسخ التعاقد ووعده النادى اليونانى بسداد كافة مستحقاته لديهم فى القريب العاجل .